Welcome to Best Western Plus Dragon Gate Inn! The Staples Center Sports Arena is just a short drive away from our Los Angeles hotel, making it easy to catch a game, concert or special performance. When you are staying in downtown, the whole city is just steps away. Our Los Angeles hotel is near the Amtrak Union Station, so guests can opt for public transportation as their vehicle of choice. The Los Angeles Convention Center is also a few minutes away, and many business travelers stay with us while they are in town for an event or tradeshow. L.A. Live and Hollywood are in the neighborhood, making it simple for our Los Angeles hotel guests to make the most of their trip. The Lakers, Clippers, Kings and Dodgers all play their home games nearby and catching one of them is an exciting addition to any vacation. We are centrally located to Universal Studios, too, which is nearly required for adventure lovers and traveling families. The Hollywood Bowl, Microsoft Theater, and Dolby Theatre are also close to our Los Angeles hotel. When planning your trip, make sure to check out the Music Center, Ahmanson, Disney Concert Hall and Broad Museum, too. Many of our guests are Dorothy Chandler fans, and will want to make that part of their trip as well. There is no shortage of things to do nearby, whether it is shopping on Rodeo Drive or visiting the beaches. If you are staying at our Los Angeles hotel on business, rest assured that you won't have to handle the famous traffic, because you will be close to everything. Some of our regular guests work with USC Hospital or the superior court, federal court or local court. We also welcome many business travelers to the financial or fashion district, and federal and state buildings bring civil servants to the area. 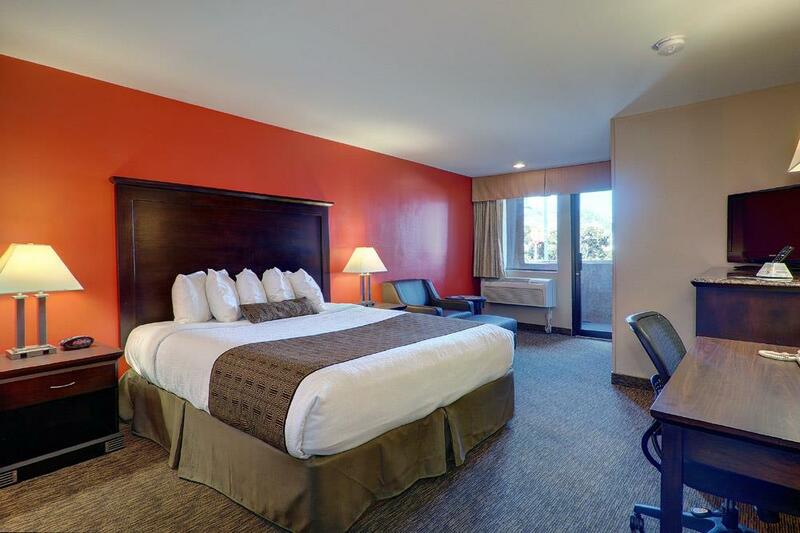 Book today and save on your room at Best Western Plus Dragon Gate Inn! Enjoy your stay. Downtown Los Angeles: .2 mile(s) from Downtown Los Angeles, a wide variety of Intercontinental Cuisine to make any city envious. Little Tokyo: 1 mile(s) from Little Tokyo , You can unwind by having sushi, sake and participating in Karaoke. Little Tokyo offers a taste of Japan without leaving the country. Olvera St.: .5 mile(s) from Olvera St., Mexican, If Mexican food is what you like, ave an authentic Mexican dinner while being serenaded at your table. From: Highway 110. Exit on Hill Street. Continue on Hill Street and the Best Western Plus Dragon Gate Inn is on left side of the street. From: Los Angeles International Airport. Take Highway 105 East to Highway 110 North, exit Hill Street to the Best Western Plus Dragon Gate Inn. From: San Francisco International Airport. Take Highway 5 South to 110 South, exit Hill Street from San Diego, take Highway 5 North to Highway 101 North to Highway 110 North, and exit Hill Street to the Best Western Plus Dragon Gate Inn. From: Arizona or Nevada. Take Highway 10 West to Highway 101 North to Highway 110 North, exit Hill Street to the Best Western Plus Dragon Gate Inn.